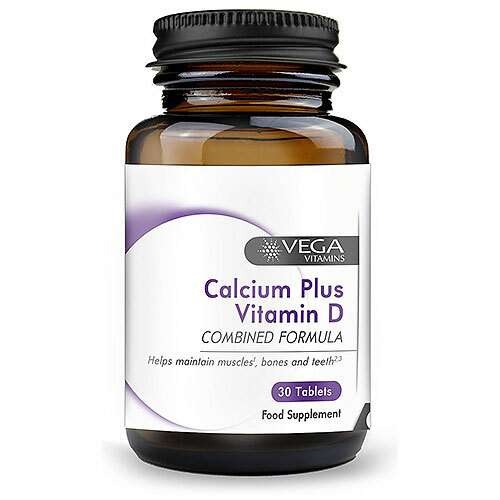 Vega Calcium Plus Vitamin D works to promote healthy bones, teeth and muscles. Vitamin D plays a central role in the regulation of calcium absorption and metabolism. Vitamin D can be produced in the skin from energy of ultraviolet rays of the sun, it is also obtained from the diet, however, it is not very abundant in the food chain. Calcium (Calcium Citrate, Calcium Carbonate, Dicalcium Phosphate), Microcrystalline Cellulose, Acacia Gum, White Tablet Coating (Hydroxypropyl Methylcellulose, Colour (Titanium Dioxide), Glycerin), Croscarmellose Sodium, Anti-Caking Agents (Silicon Dioxide, Magnesium Stearate), Antioxidants (DL-Alpha Tocopheryl Acetate, DL Alpha Tocopherol), Corn Maltodextrin, Cellulose, Vitamin D2 (Ergocalciferol). As a food supplement for adults, take 1-2 tablets daily with food or as directed by a healthcare professional. 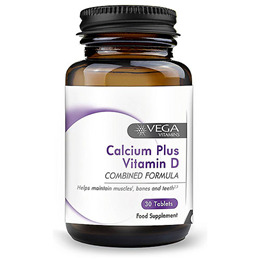 Below are reviews of Vega Vitamins Calcium Plus Vitamin D - 30 Tablets by bodykind customers. If you have tried this product we'd love to hear what you think so please leave a review. Good product, nearly as strong as the ones I now get on prescription. Everyone should take these!